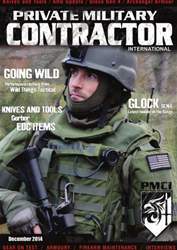 Welcome to Issue 3 of Private Military Contractor International, the only magazine dedicated to the Private Military sector. In this issue we get to speak to the people behind some of the brands we have come to know and trust; brands like Archangel Armor, Wild Things Tactical, the TYR Group and Associated Risks Group. We've got six pages of gear and get to grips with the new Gen 4 Glocks, as well as reviewing a couple of good books to read and, of course, give you a 4-page listing of Recruitment companies. We hope you enjoy this issue and, wherever you are in the World, wish you a peaceful Christmas and a very happy New Year!